The physical signs and socio-economic impacts of climate change are accelerating as record greenhouse gas concentrations drive global temperatures towards increasingly dangerous levels, according to a new report from the World Meteorological Organization (WMO). The WMO climate statement includes input from national meteorological and hydrological services, an extensive community of scientific experts and United Nations agencies. It details climate related risks and impacts on human health and welfare, migration and displacement, food security, the environment and ocean and land-based ecosystems. It also catalogs extreme weather around the world. “Extreme weather has continued in the early 2019, most recently with Tropical Cyclone Idai, which caused devastating floods and tragic loss of life in Mozambique, Zimbabwe and Malawi. It may turn out to be one of the deadliest weather-related disasters to hit the southern hemisphere,” said Taalas. The start of this year has also seen warm record daily winter temperatures in Europe, unusual cold in North America and searing heatwaves in Australia. Arctic and Antarctic ice extent is again well below average. According to WMO’s latest Global Seasonal Climate Update (March to May), above average sea surface temperatures – partly because of a weak strength El Niño in the Pacific – are expected to lead to above-normal land temperature, particularly in tropical latitudes. U.N. Secretary General António Guterres, wrote in the report: “The data released in this report give cause for great concern. 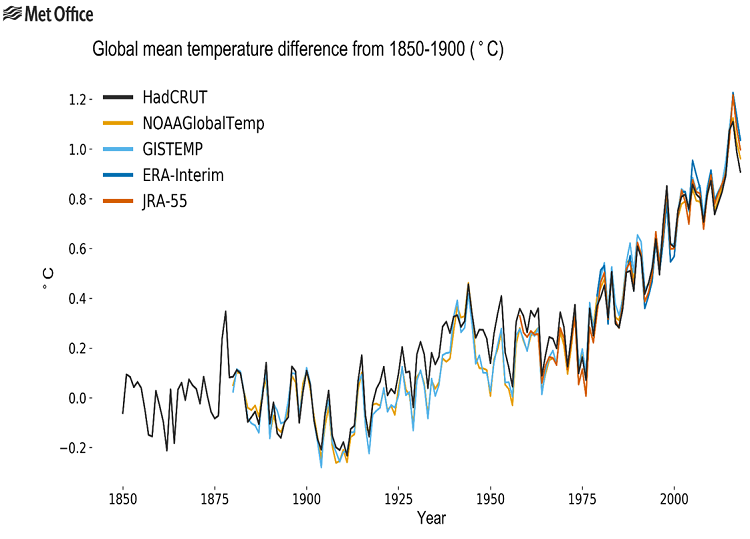 The past four years were the warmest on record, with the global average surface temperature in 2018 approximately 1°C above the pre-industrial baseline. Hazards: In 2018, most of the natural hazards which affected nearly 62 million people were associated with extreme weather and climate events. Floods continued to affect the largest number of people, more than 35 million, according to an analysis of 281 events recorded by the Centre for Research on the Epidemiology of Disasters (CRED) and the U.N. International Strategy for Disaster Risk Reduction. Hurricane Florence and Michael were two of 14 “billion dollar disasters” in 2018 in the U.S. They triggered around $49 billion in damages and over 100 deaths. Super typhoon Mangkhut affected more than 2.4 million people and killed at least 134 people, mainly in the Philippines. More than 1,600 death were associated with intense heat waves and wildfires in Europe, Japan and the U.S., where they were associated with record economic damages of nearly $24 billion in U.S. The Indian state of Kerala suffered the heaviest rainfall and worst flooding in nearly a century. Food security: Exposure of the agriculture sector to climate extremes is threatening to reverse gains made in ending malnutrition. New evidence shows a continuing rise in world hunger after a prolonged decline, according to data compiled by U.N. agencies including the Food and Agriculture Organization and World Food Programme. In 2017, the number of undernourished people was estimated to have increased to 821 million, partly due to severe droughts associated with the strong El Niño of 2015–2016. Displacement: Out of the 17.7 million Internally Displaced Persons (IDPs) tracked by the International Organization for Migration, over two million people were displaced due to disasters linked to weather and climate events as of September 2018. Drought, floods and storms (including hurricanes and cyclones) are the events that have led to the most disaster-induced displacement in 2018. In all cases, the displaced populations have protection needs and vulnerabilities. According to UNHCR’s Protection and Return Monitoring Network, some 883,000 new internal displacements were recorded between January and December 2018, of which 32 percent were associated with flooding and 29 percent with drought. Environmental Impacts include coral bleaching and reduced levels of oxygen in the oceans. Others include loss of “Blue Carbon” associated with coastal ecosystems such as mangroves, seagrasses and salt marshes; and ecosystems across a range of landscapes. Global warming is expected to contribute to the observed decrease of oxygen in the open and coastal oceans, including estuaries and semi-enclosed seas. Since the middle of the last century, there has been an estimated one to two percent decrease in the global ocean oxygen inventory, according to UNESCO’s Intergovernmental Oceanographic Commission (UNESCO-IOC). Climate change has emerged as a significant threat to peatland ecosystems, because it exacerbates the effects of drainage and increases fire risk, according to U.N.-Environment. Peatlands are important to human societies around the world. They contribute significantly to climate change mitigation and adaptation through carbon sequestration and storage, biodiversity conservation, water regime and quality regulation, and the provision of other ecosystem services that support livelihoods. Ocean heat: 2018 saw new records for ocean heat content in the upper 700 meters (data record started in from 1955) and upper 2,000 meters (data record started in 2005), topping the previous record set in 2017. More than 90 percent of the energy trapped by greenhouse gases goes into the oceans and ocean heat content provides a direct measure of this energy accumulation in the upper layers of the ocean. Sea level: Sea level continues to rise at an accelerated rate. Global Mean Sea Level (GMSL) for 2018 was around 3.7 millimeters higher than in 2017 and the highest on record. Over the period January 1993 to December 2018, the average rate of rise is 3.15 ± 0.3 mm per year while the estimated acceleration is 0.1 mm/yr2. 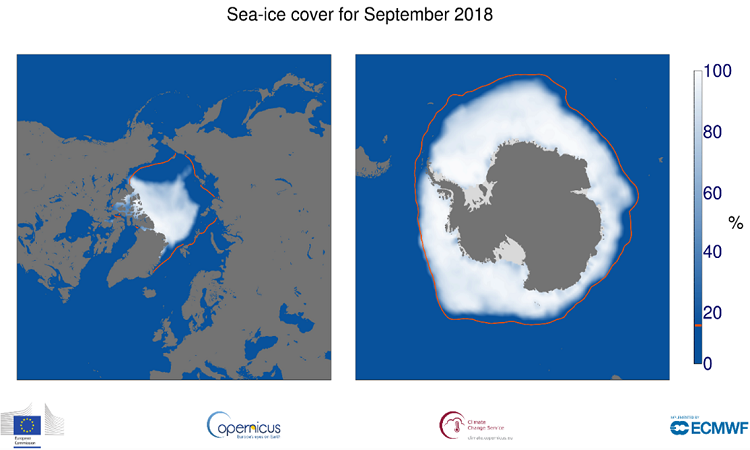 Increasing ice mass loss from the ice sheets is the main cause of the GMSL acceleration as revealed by satellite altimetry, according to the World Climate Research Programme global sea level budget group, 2018. Ocean acidification: In the past decade, the oceans absorbed around 30 percent of anthropogenic CO2 emissions. Absorbed CO2 reacts with seawater and changes the pH of the ocean. This process is known as ocean acidification, which can affect the ability of marine organisms such as molluscs and reef-building corals, to build and maintain shells and skeletal material. Observations in the open-ocean over the last 30 years have shown a clear trend of decreasing pH. In line with previous reports and projections, ocean acidification is ongoing and the global pH levels continue to decrease, according to UNESCO-IOC.